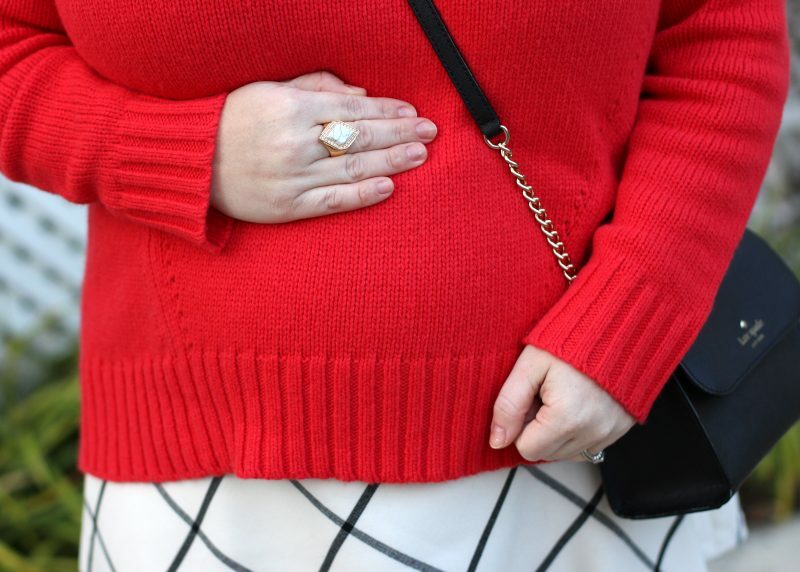 I always find myself in a pop of red during the month of February, how convenient! 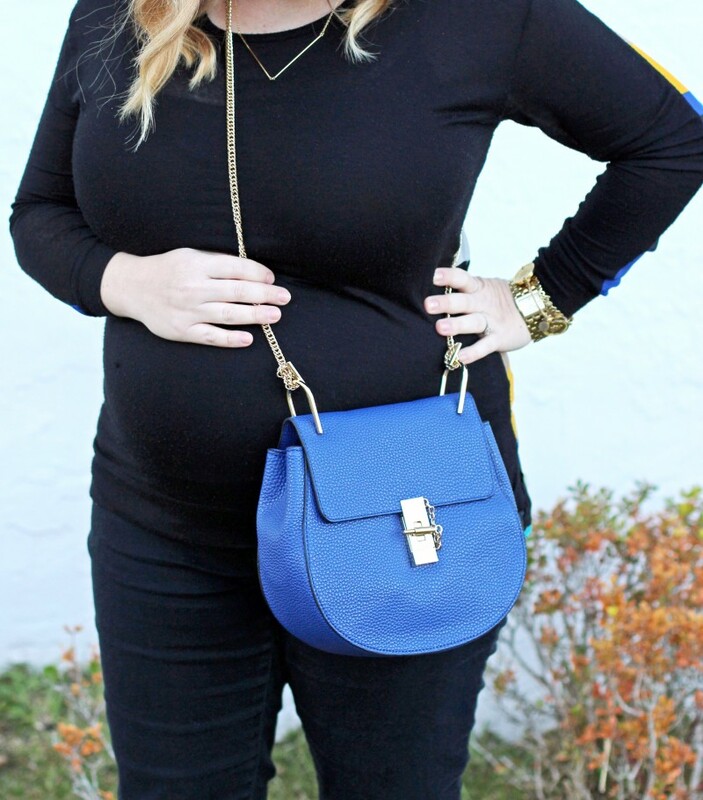 Here are the details of this oversized sweater, perfect for a cozy holiday weekend. 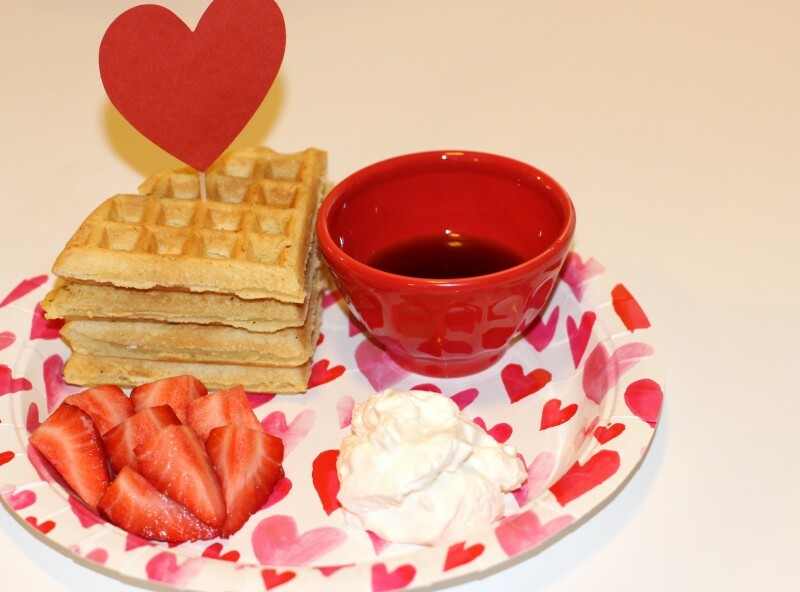 At last, another 3-day weekend, just what the doctor ordered this Valentine’s Day! 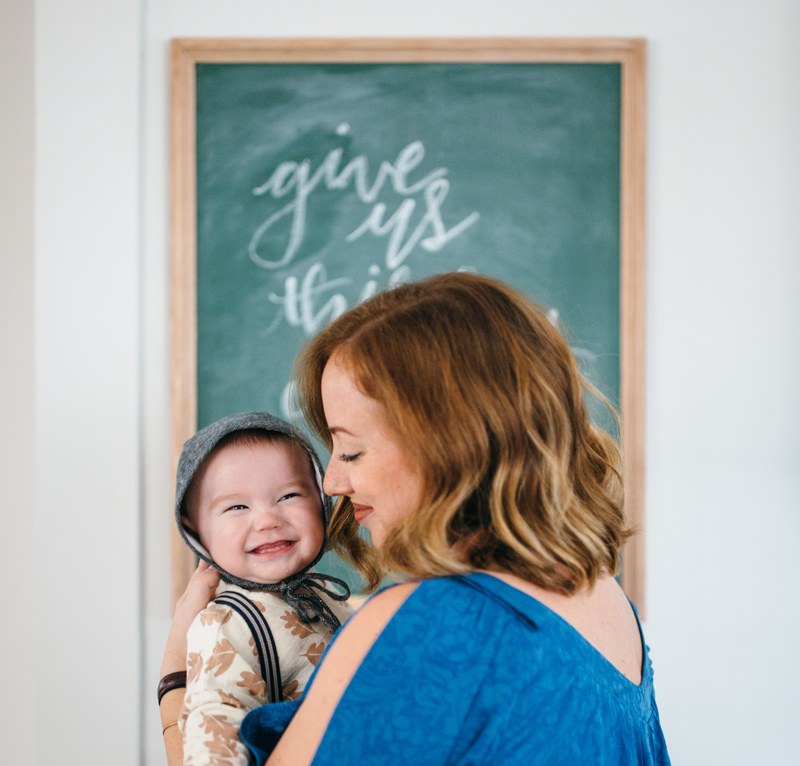 Between getting ready for a baby, purchasing our first home, and a few stressful weeks at work, I am looking forward to having an extra day off… to create a baby registry & pack up my house! Valentine’s Day just so happens to be the hubs and my 2 year wedding anniversary. I have been dreaming of our dinner reservations ALL WEEK LONG. My absolute fav restaurant in Jacksonville, Orsay. Side note: I feel obligated to explain that I am not some Valentine’s Day obsessed girl. We wanted to get married on a Friday in February since it was a destination wedding. Valentine’s Day falls on a 3-day weekend, so we just ran with the idea! With that being said, I do LOVE romance, flowers, pink, hearts, and sparkles… you could say it turned out to be a WIN, WIN! 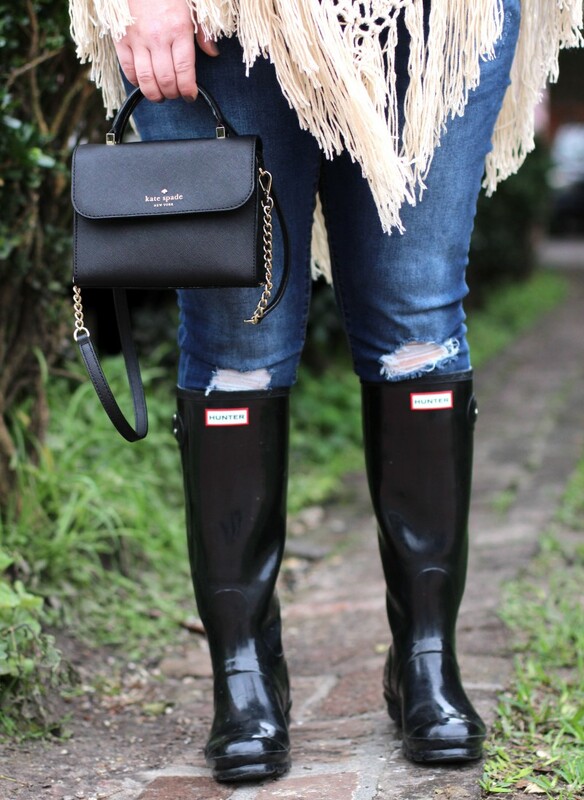 This year, it is all about cozy & casual. 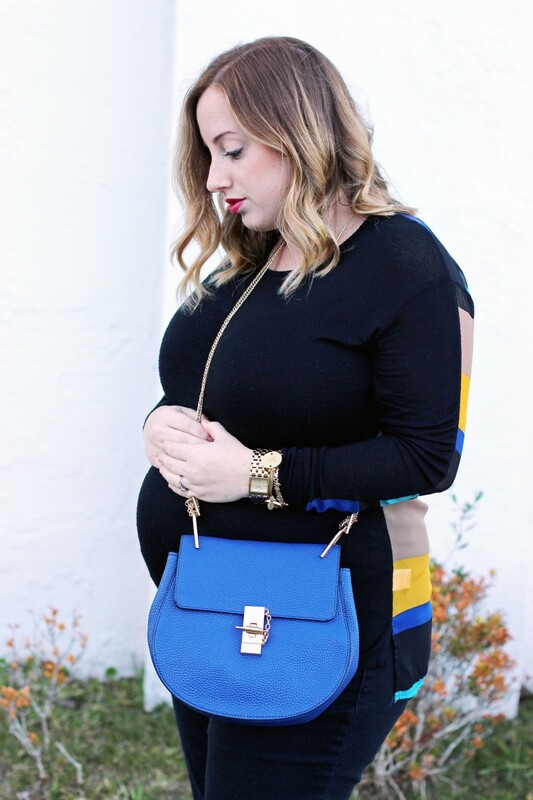 This mama-to-be plans on keeping it chic in this tunic sweater, which is currently half off a la J. Crew!! 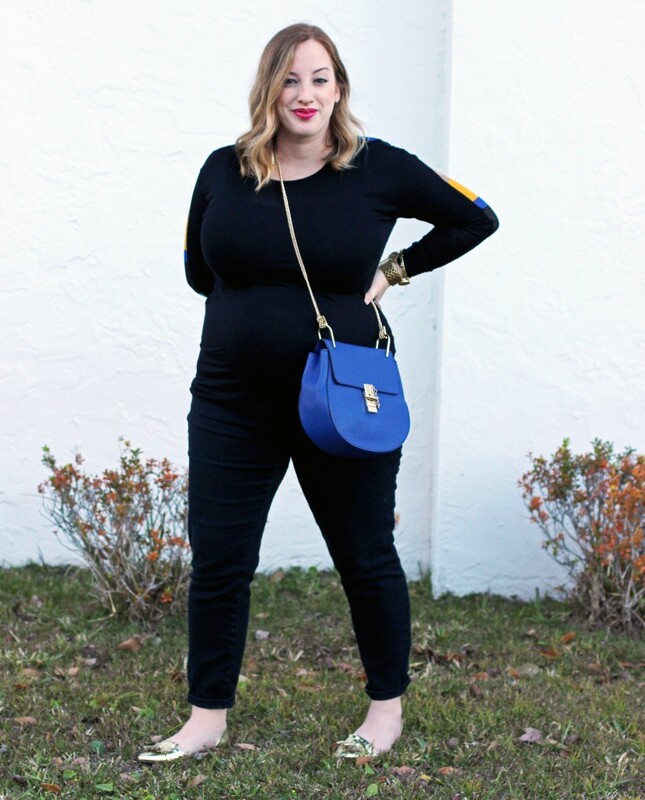 I would recommend considering sizing down. 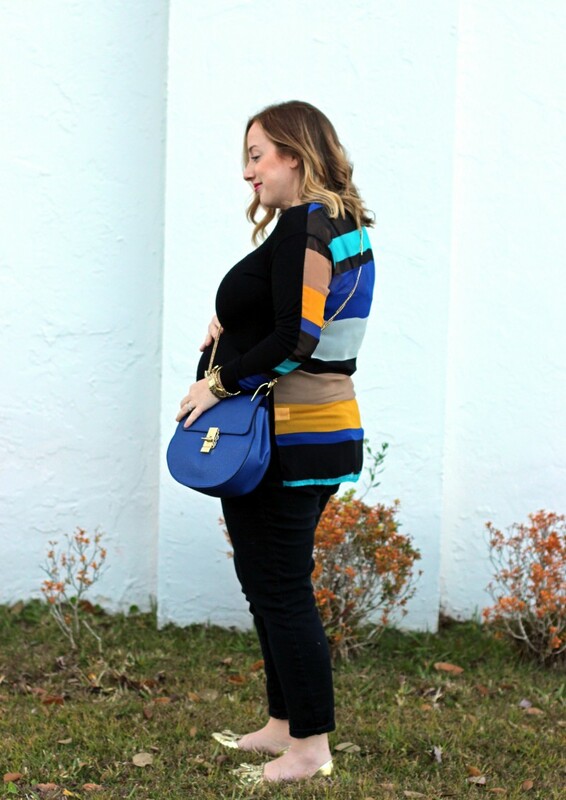 I am wearing my typical size, medium, however I think a small would have worked too. It just depends on how slouchy/comfortable you want to sport it. 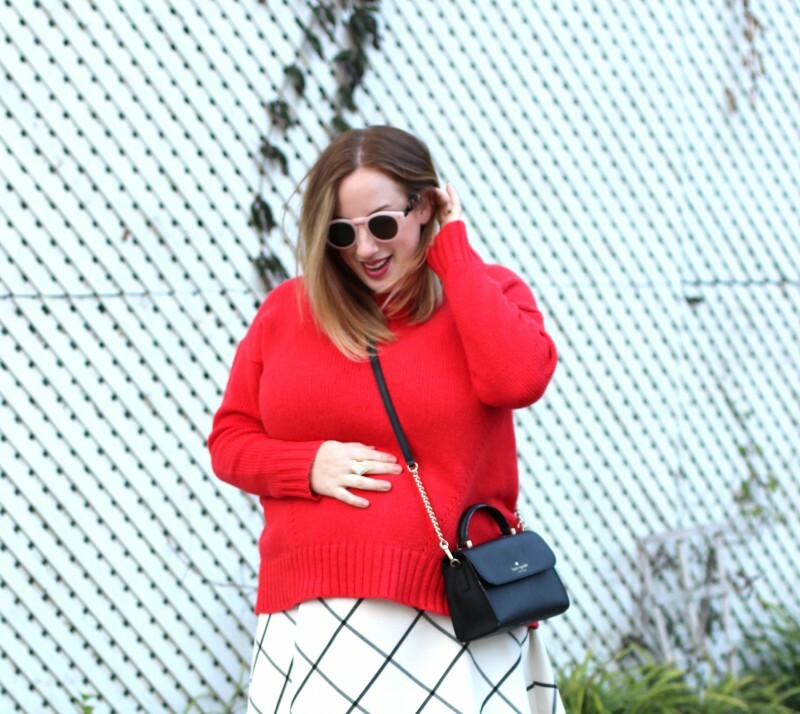 I purchased this skirt last winter from the Loft and it has remained a staple in my closet. I have linked a few similar style skirts. 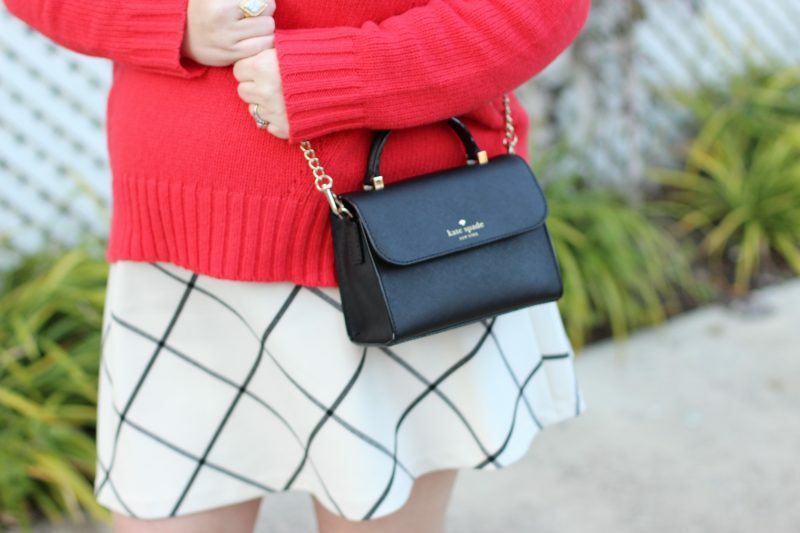 Finally, my girl Kate Spade is having a great sale this weekend, HOLLA! What are your weekend and Valentine’s Day plans? 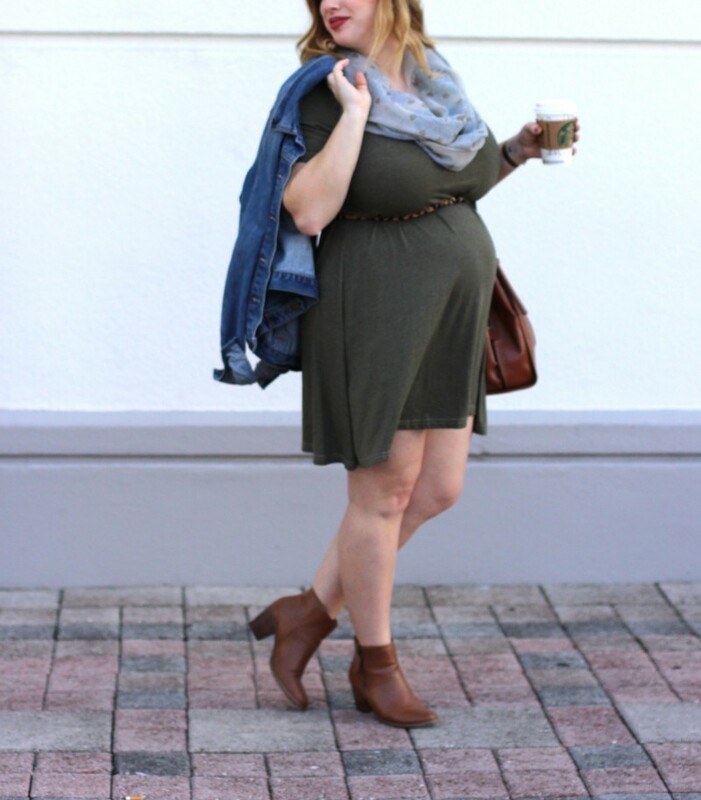 This Natural Life outfit hits all of my boho checks: soft, organic, and feminine. I can always get behind a company like Natural Life, they radiate positive vibes, and who doesn’t love some positive vibes! 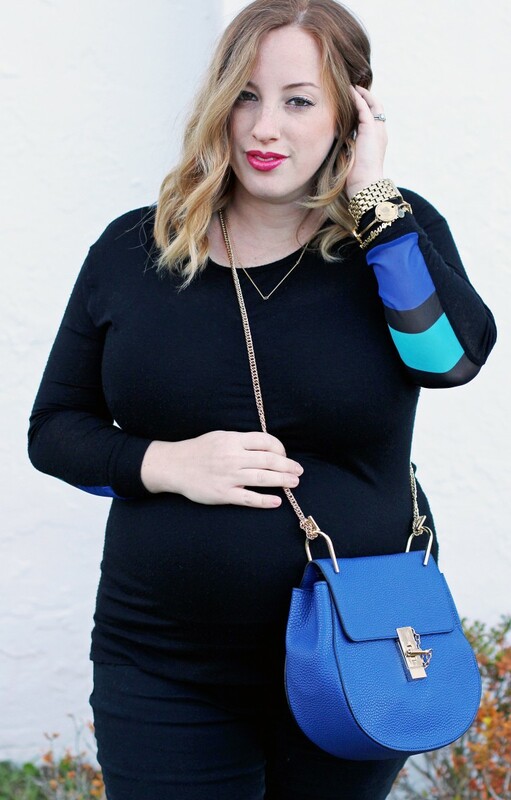 Natural Life is a boho-inspired website that specializes in clothing, gifts, and decor. You will want to check out the website to learn all about their feel-good gifts. If you have any questions about the Natural Life brand, please don’t hesitate to ask me! 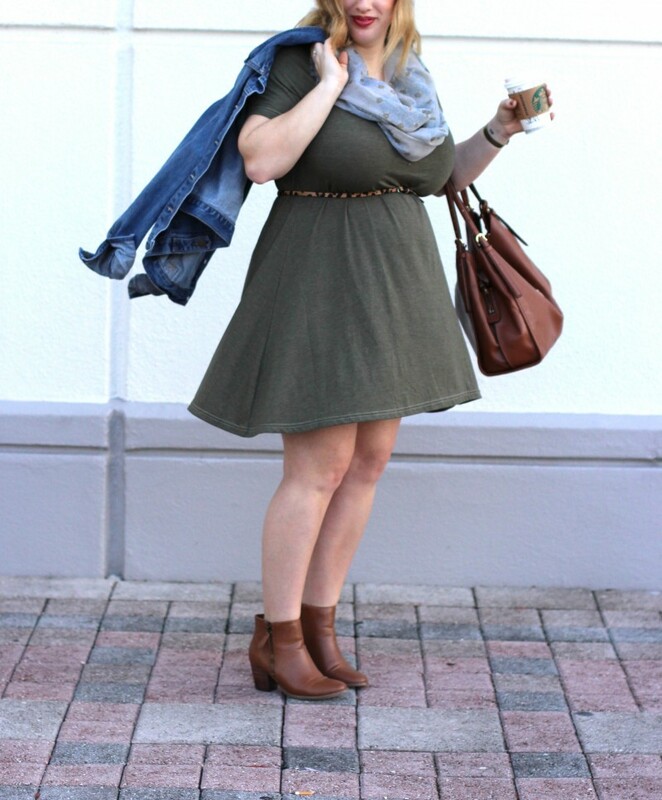 This olive dress is SUPER soft and effortless, making it the perfect casual dress. The awesome thing about Natural Life is that each garment has hand embroidery and special dying techniques, so no two pieces are identical. 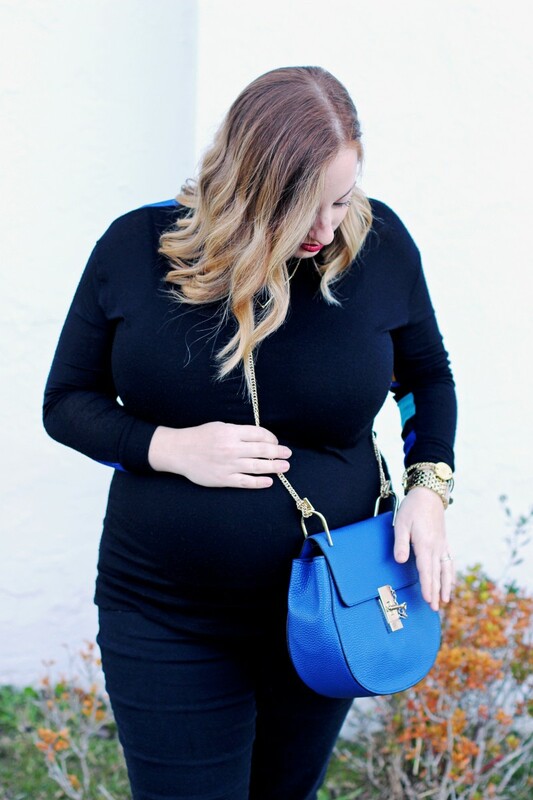 Although this dress is not a maternity item, the “flowiness” allows it to double as a maternity dress.. which of course doubles the value for this mama-to-be! 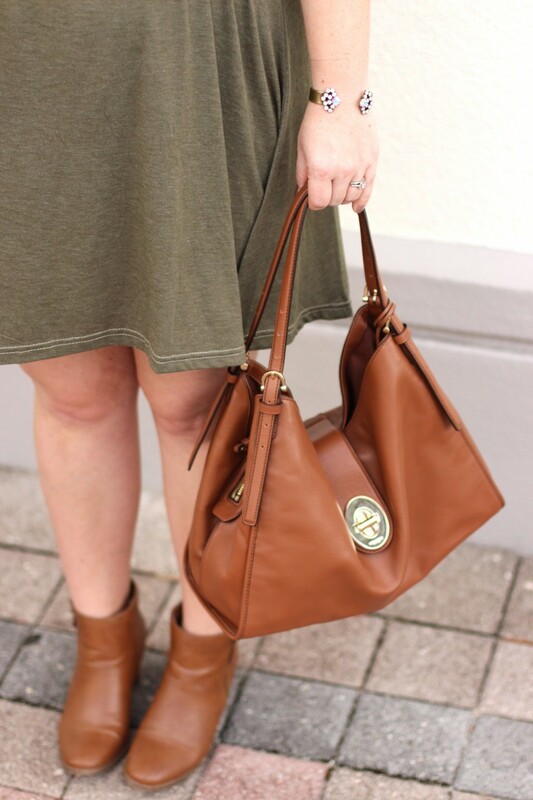 I paired this boho-chic style with cognac booties and Coach purse, love this color scheme. If you have not already subscribed to Rocksbox, be sure to use promo code “dccoldxoxo” to get your first month free! Melt the butter. Grumble graham crackers into fine texture (I use a wooden spoon to smash them in a large bowl). Mix the melted butter throughout the graham crackers to create the crust. Scoop two small spoonfuls into the bottom of each mason jar. 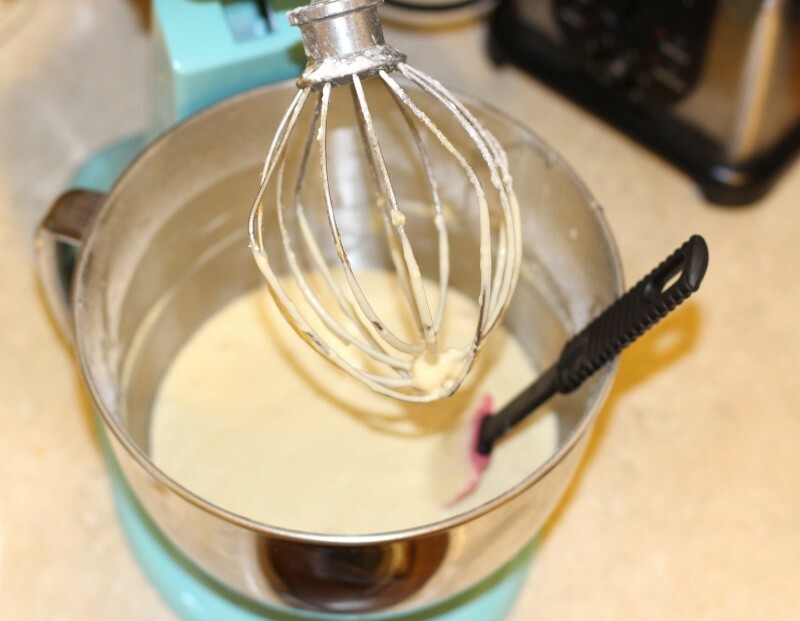 Make Cool Whip with Mixer: Pour 12 ounces of heavy cream into the mixer. Place the speed setting half way and slowly add in 1/2 cup powder sugar and vanilla extract. Then put the speed up to 8 or 10 and within a minute you should see the cream turning thick. The cool whip will begin to create peaks in the mixer and you will be able to tell that it is ready. Should not take more than 2 minutes on high speed. Set aside 1 cup of cool whip for garnish/topping at the end. Put one cup of cool whip into a freezer bag and cut a small hole in the corner to create your own piping bag. In the mixer bowl with the remaining cool whip, add the 2 cream cheeses and the strawberry preserves to create the cheesecake. Mix for about a minute on medium. Place the cheesecake batter into another large freezer bag and cut a small hole in the corner to create a piping bag. 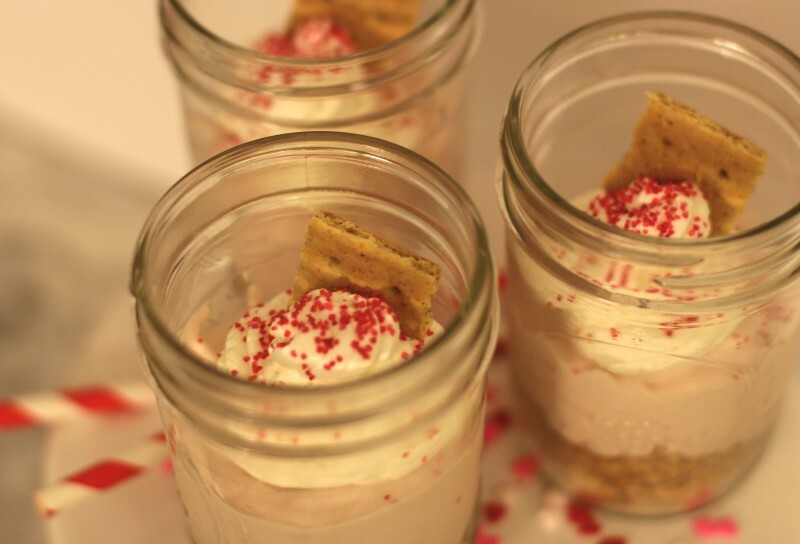 Squeeze the strawberry cheesecake into each mason jar over the graham cracker crust. Fill jars until 2/3’s full. Top each jar with the cool whip that was set aside in Step 3. Garnish with sprinkles and graham crackers! The jars need to be refrigerated immediately after. I recommend placing the jars in the freezer for an hour before serving them. This no-bake cheesecake is a hassle-free must-try. 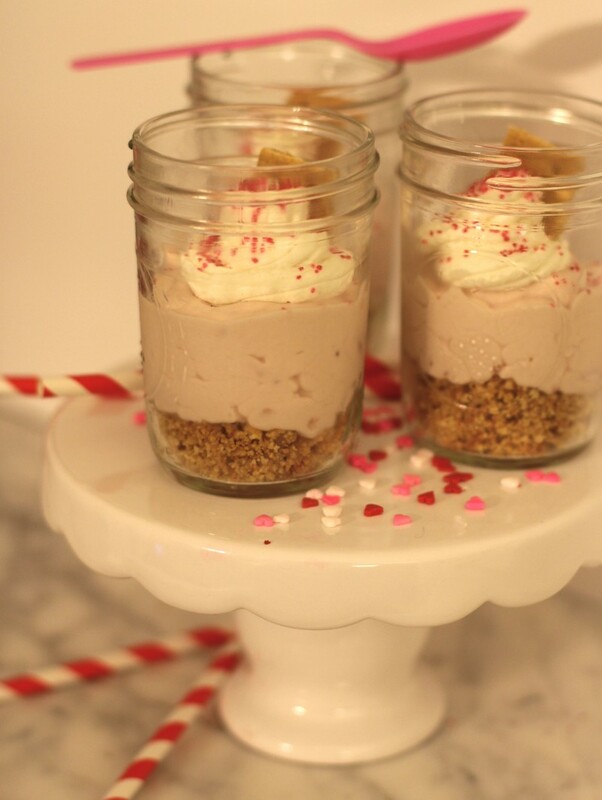 This dessert was inspired from a Nutella Cheesecake in mason jars that I created the very first month of Drafts & Crafts, June 2014! 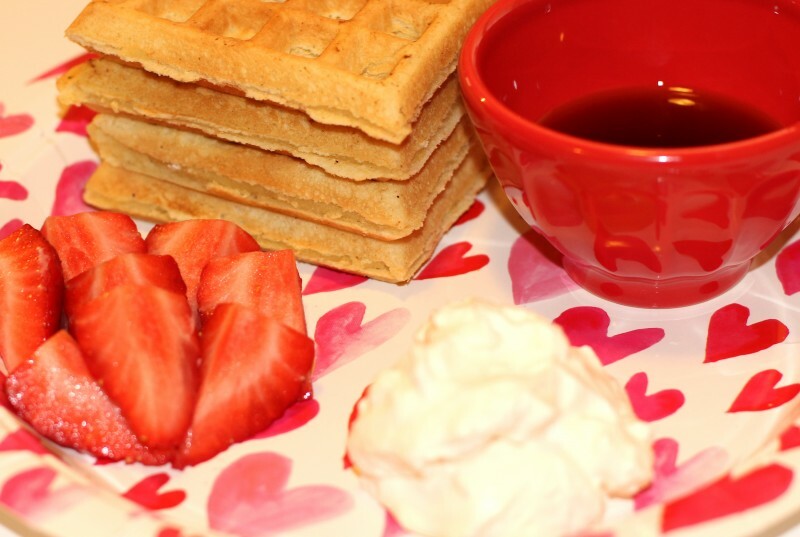 (You can find that recipe at the very bottom of the “Kitchen” tab) I love February because it means everything is pink, sparkly, and covered in sprinkles- like we really need another excuse! This is a fun recipe to serve if you are hosting or attending a Galantine’s get-together. This light, fluffy dessert is the perfect grab and go treat. What sweets are you making your hunny or BFFs this holiday? ?